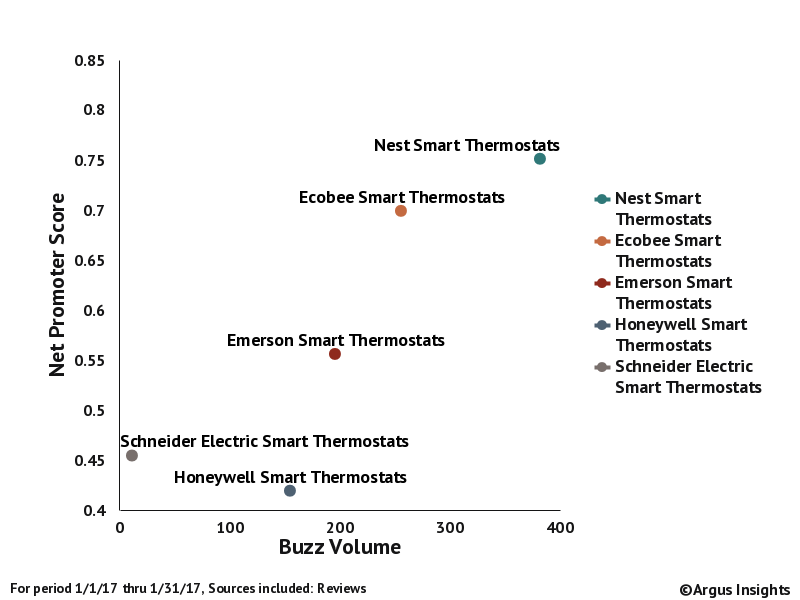 Out of over 1000 new reviews of Smart Thermostats authored by consumers in the month of January, we see that Nest is maintaining their leadership over the other brands within the market, both in terms of consumer demand and perception of the products as measured by Net Promoter score. The buzz level is down almost 50% from December when consumers, giddy with their holiday gifts, shared their views of their newly intelligent comfort control in greater numbers than we are seeing in January. Ecobee provides the biggest competitive threat to Nest in terms of both consumer perception of the overall experience and the consumer demand. 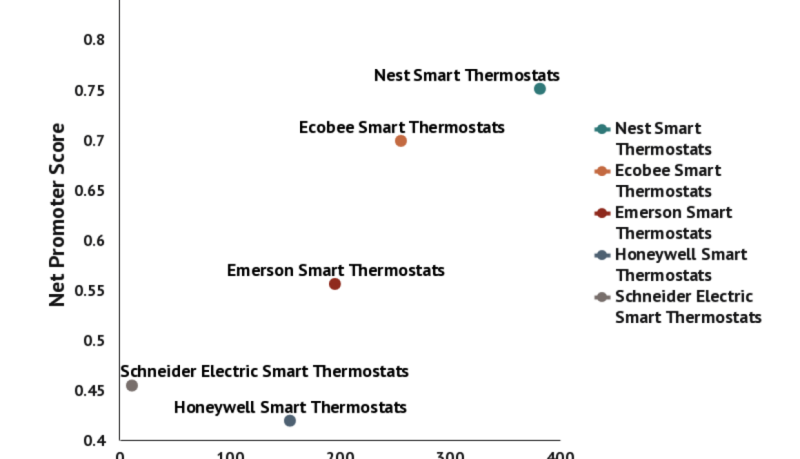 Schneider Electric, though a smaller player, performs well against Honeywell from a Net Promoter score, indicating though the Wiser Air Thermostat may not have as large as an install base, those consumers that find their way into Schneider’s ecosystem are happier overall than Honeywell at this stage. Consumers have a better chance of getting a product they won’t feel like ripping off the wall in a few weeks if they select any of these based, based on the verdict handed down by the court of public opinion. Our next post will explore some of the features of these products such as ease of installation. Get your own access to the latest Smart Home consumer insights by subscribing to the Argus Analyzer platform. A Product Fit Insights plan includes all consumer reviews across the Smart Home ecosystem for the last quarter, including data like you see above. Check out how you can let the Argus Analyzer do the heavy lifting of collecting, analyzing and summarizing that is happening with you and the competition!